Microsoft Azure is an integrated suite of tools, templates, and managed services to significantly improve the productivity of any developer or IT professional. 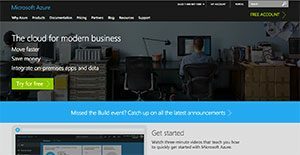 With its massive set of features and functionalities, and build for the Microsoft platform, Azure makes it easier for IT professionals to build and manage enterprise, mobile, Web and Internet of Things (IoT) apps. The advantages of Microsoft Azure are compatibility with Windows, Linux, and container as well as an excellent front-end management interface. The software solution also offers a public cloud architecture that is helpful in the Infrastructure-as-a-Service (IaaS) field. Ideal for businesses that utilize Windows or Linux for their operations, this software has over 100 services equipped with end-to-end features that will help you optimize your workflow. It allows you to create a wide variety of applications using AI services as well as helps you develop and deploy programs however you wish. With Microsoft Azure, developers and IT workers have a platform that lets them easily create and deploy modern, cross-platform web and mobile applications. The system also allows them to store information in the cloud and back them up for quick and easy recovery. Azure lets you run your enterprise applications as well as large scale computing processes and implement powerful predictive analytics. The Azure platform also enables users to create intuitive products and services by leveraging Internet of Things services. Azure operates on a global network of Microsoft-managed datacenters spanning 22 regions. You can start for and scale up as your traffic improves. Build with Node.js, PHP, or ASP.NET and deploy in seconds with TFS, Git, or FTP. You can easily deploy and run Linux and Windows Server virtual machines. Plus, you can migrate apps and infrastructure without changing existing code. Speed up your connected client app development. You can also incorporate push notifications, user authentication, and structured storage in minutes. Create highly available, infinitely scalable apps and services using a rich Platform as a Service (PaaS) environment. On top of that you can support elastic scale, automated deployments, and multi-tier scenarios. Make use of a fully compatible enterprise-ready Hadoop service. This PaaS solution offers easy management and integrates with System Center and Active Directory. Finally, you can create, manage and distribute media in the cloud. This PaaS solution offers everything from content protection to encoding to analytics support to streaming. Keep in mind that Microsoft Azure should not be confused with AzureDesk which is a completely different product. If you you need more details on it you can read our AzureDesk review. Enterprises have different needs and requirements and no software application can be ideal in such a scenario. It is pointless to try to find an ideal off-the-shelf software app that meets all your business needs. The wise thing to do would be to modify the application for your special wants, worker skill levels, finances, and other elements. For these reasons, do not hasten and pay for well-publicized popular systems. Though these may be widely used, they may not be the perfect fit for your specific needs. Do your groundwork, look into each short-listed system in detail, read a few Microsoft Azure reviews, call the maker for explanations, and finally select the app that offers what you need. We realize that when you make a decision to buy IT Management Software it’s important not only to see how experts evaluate it in their reviews, but also to find out if the real people and companies that buy it are actually satisfied with the product. That’s why we’ve created our behavior-based Customer Satisfaction Algorithm™ that gathers customer reviews, comments and Microsoft Azure reviews across a wide range of social media sites. The data is then presented in an easy to digest form showing how many people had positive and negative experience with Microsoft Azure. With that information at hand you should be equipped to make an informed buying decision that you won’t regret. What are Microsoft Azure pricing details? What integrations are available for Microsoft Azure? If you need more information about Microsoft Azure or you simply have a question let us know what you need and we’ll forward your request directly to the vendor.